ESPN.com: Page 2 : How hard is it to run an NBA team? Editor's Note: This column appears in the March 15 edition of ESPN The Magazine. Hours before the Celtics traded for Chucky Atkins, I caught wind of the deal and suffered a total meltdown. I banged a table with my fist, pushed over a chair, dropped a few F-bombs. I may as well have been wearing a Rasheed Wallace jersey. Not pictured -- the trampoline Radja used to dunk. As my dog, Dooze, scurried for safety, I stomped over to my laptop and whipped up an angry e-mail to a friend, in which I detailed every reason the trade shouldn't happen. The gist: thanks to Danny Ainge, we were already headed to the lottery, and, as the NBA teaches us every summer, cap flexibility matters over everything else. So why target a mediocre guard with two-plus years and $9 million left on his contract? Was a lame pick and some cash really worth that? I was dumbfounded. Three hours later, the trade went through. And that's when I realized I should be running the Celts. Since Bird retired in 1992, I've watched five different guys wreck my team over three presidential terms. We signed washed-up stars like Nique, Pervis and The X-Man, shelled out insane contracts to stiffs like Dino Radja and Vitaly Potapenko, imported career losers like Todd Day and Ricky Davis. We traded for other team's expensive mistakes -- Kenny Anderson, Vin Baker, Raef LaFrentz -- with no thought to the cap ramifications. We gave up on future stars like Chauncey Billups and Joe Johnson, and gave away solid vets like Rick Fox, Eric Williams and David Wesley. And we blew so many picks, they could be living in a reality TV house right now. Look out, Joe Forte just pulled a fork on Jerome Moiso! Examine every Boston mistake, and that word, or rather its absence, is at the root of it. For instance, Chris Wallace used Denver's 2001 pick to take Kedrick Brown at No. 11, wasting the option to keep rolling over the pick until Denver had one of the first three selections. At the time, my dad went crazy: "Denver always stinks and they're in a good conference. We can't waste that pick now!" Two years later, the Nuggets fell apart -- of course they did -- and landed Carmelo at No. 3. The entire course of events took between four and six months off my dad's life. 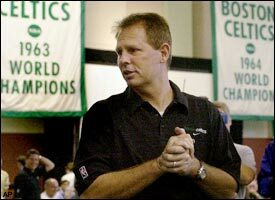 Now, look at Ainge. He routinely killed Antoine Walker on TNT, never imagining he'd be running the Celts someday. So once he got the job, instead of hashing things out with Toine, he frantically shopped the All-Star all summer in a buyer's market. For godsakes, everyone loves their team in September! Eventually, Danny panicked and took Jiri Welsch and $60 million worth of Raef LaFrentz, even though Boston's doctors warned Danny about Raef's knees. Raef went under the knife within two months. I had to keep from lighting myself on fire. Any second now, Ainge will inform Celtics owners that they've been punk'd. Twelve years. Five regimes. Five disasters. But incompetence isn't the sole property of the C's. Research the recent histories of the Warriors, Hawks, Wizards, Clippers, Cavs ... it's a murderer's row of helplessness. It's the rare GM who displays even rudimentary foresight. Kiki Vandeweghe stripped Denver's roster like an old Corvette, then added pieces -- Carmelo, Andre Miller, bench guys like Earl Boykins and Jon Barry -- while maintaining cap space. Now, compared with some of the dummies running other teams, Kiki looks like Stephen Hawking. And this is the guy who drafted Nikoloz Tskitishvili over Amare Stoudemire. Really, can it be that hard to run a team? Look how Jerry West transformed the Grizzlies. Instead of blowing things up, he built around young guys already there, then brought in Hubie Brown as his Mr. Miyagi. Now West has one of the most enviable situations around -- a quality young team with tradable pieces, led by a Spanish metrosexual. Now that's how it's done. If I were a GM, I'd give my roster a chance to jell -- like Sacramento or New Jersey did, so I knew exactly what I had. I wouldn't take on other teams' mistakes. I wouldn't clog my cap except for a sure thing (a rule for any aspect of life, by the way). I wouldn't pay two half-decent guys $15 million apiece when I could earmark it for one superstar. I wouldn't give up on young players unless I had a legitimate chance at a title. I wouldn't roll the dice with drunks, druggies and gimps. In short, I wouldn't panic. Look, it's as easy as making a stew -- throw everything in a pot and let it simmer. Note to the Celtics' owners: You have my number. I can be there in 24 hours. Just say the word. The Sports Guy: Spoiled rotten?